High Court To Decide: Who Owns Preserved Beach? The U.S. Supreme Court hears a dispute over efforts to prevent beach erosion. Property owners say their land extends to the water's edge. Whether a decision by the judicial branch can amount to improper taking is one of the great unanswered constitutional questions remaining in American law. High Court To Decide: Who Owns Preserved Beach? 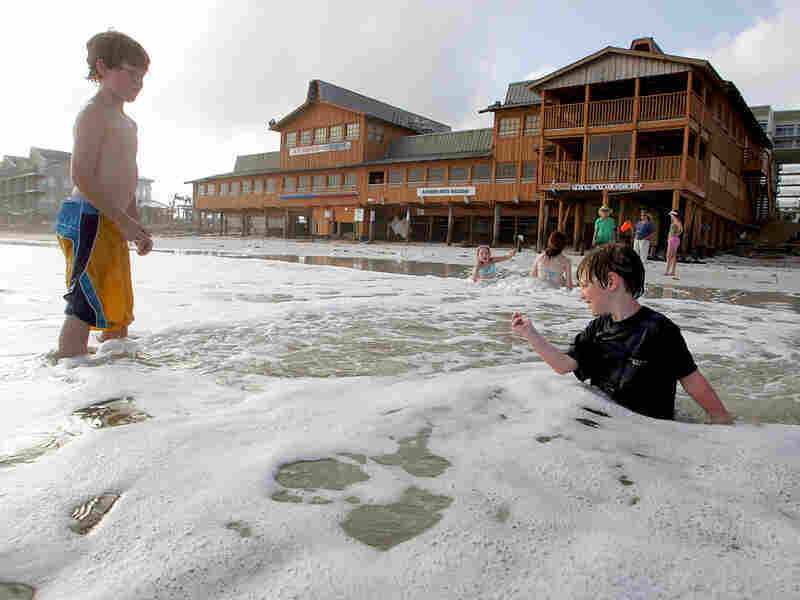 A family plays in the surf at Destin, Fla., where efforts to preserve the beach have led to new questions of ownership. The U.S. Supreme Court hears a major property rights case Wednesday, a case from Florida that pits the state's need to prevent beach erosion against the rights of property owners to keep ownership of the land at the water's edge. At issue in the case is the demarcation of what is private and what is public land at the shoreline. And the facts in the dispute are almost as amorphous as the line of dry beach in the sway of the tides. Florida has more than 2,000 miles of ocean shoreline, including some 820 miles of sandy beach — beach that has been consistently eroding. So much so that for the past four decades, the state and local governments have poured millions of dollars into beach restoration projects that pump sand into eroded areas to create a kind of sand buffer to protect the beach from storm damage and further erosion. With hurricanes frequently bashing parts of the state, these restoration programs were not only uncontroversial, but popular with home and business owners, who literally saw the water lapping at their property. Michael Sole, secretary of the Florida Department of Environmental Protection, says about half the state's beaches are in jeopardy. "So the issue is actually conducting beach restoration," said Sole, "to maintain not only the benefits of the beach" for recreation and tourism, but also for storm protection that benefits the private landowners. Restoration Project Or 'Land Grab'? Until the last decade, the Florida Panhandle did not suffer the same kind of hurricane and storm damage that the southern part of the state did. But state and local officials saw that changing in recent years, and decided to spend a total of $15 million on a beach restoration project in Walton County — $4 million of it paid by the state, the rest paid for by the local community, including the town of Destin. With that kind of money being spent to preserve the beach, the state set the property line for private beachfront property owners where it was when the project began — at the wet sandy beach. And if, because of the restoration, the dry beach extended farther out toward the water, that would be considered public property. To some of the homeowners, like Slade Lindsey, the restoration project "was simply a land grab." Or, as he puts it, local and state officials were putting sand in his backyard and "converting it to a public beach." Not so, counter the state and local governments, who say all they have done is make permanent the line of demarcation between private land and state land. Instead of the property owners' land moving with the tides, it is set where the wet sandy beach was. And if the restoration project creates a narrow strip of new dry beach, where there once was water — that is public property, just as the land under the ocean was once public property. The newly created strip of beach, whether or not it is covered with water, belongs to the public, says Deborah Flack, president of the Florida Shore and Beach Preservation Association, a league of coastal cities and towns. "This new area of beach was in fact created by state-owned sand, and it's being put on what was sovereign submerged state land, at a significant cost to the taxpayer," said Flack. "So clearly, we're talking about a recreational beach that should be open to the public." The access rights of the private property owners are still protected, says the state. State law bars anything obscuring a homeowner's view; bars building any structure; and guarantees the same water access. The public has always had some access to a private property owner's beach. Florida state law has always allowed the public to traverse private beach property along the shoreline, and the local government in Destin provides paths to the sea alongside Lindsey's property. But Lindsey and five other homeowners are challenging the erosion restoration project as a taking of their land without just compensation. His property line, he concedes, is not much different than it ever was. On some days, the beach is bigger than it used to be, and on some days it is smaller. But he says he bought the house believing that he, in essence, had a private beach and could rent the house as having a private beach. Now, he fears that undesirable members of the public may put down their blankets, picnic or whatever on any newly created strip of public beach. "If it's state-owned land, we don't have the right to tell them to go away," Lindsey said. Sole says that most of the landowners have not objected to beach erosion control projects because they enhance the value of the property, protect roads and utilities around the property, and protect the state's No. 1 industry: tourism. Tropical Storm Ida this year proved the value of these projects, Sole said. "Where we did beach restoration, we had hardly any damage. The beach actually served its purpose," he said. "Where we did not have beach restoration, we had significant damage. We had sea walls actually crumbling. So it's clear that this beach, and these beaches, provide a significant value not only to the upland homeowners, but to the infrastructure that's there along the coast as a whole." Lindsey and his lawyer, D. Kent Safriet, contend that the real reason the state and local governments are interested in beach restoration is to create more public beaches for tourism. "What they needed in this case was to make a public beach open to the tourists for their economy," Safriet said. And if the state and local governments want to do that, he says, they have to pay for the land. "No one is saying they can or can't create the public beach," Safriet said. "They just gotta do it the right way, and pay for it." But the Florida Supreme Court said the state did do it the right way — and that landowners are asking for something they are not entitled to under state law. Now the case has been kicked up to the next level, the U.S. Supreme Court, where the question is, in part, whether a state court decision interpreting state law can amount to an unconstitutional taking of property. It's a question that has never been resolved by the U.S. Supreme Court. Yes, the court has said, a decision by the legislative or executive branch can amount to an unconstitutional taking. But whether a decision by the judicial branch can also amount to a taking is one of the great unanswered constitutional questions yet remaining in American law. In its ruling, the Florida Supreme Court said the beach restoration program reflected "the state's constitutional duty to protect Florida's beaches in a way that reasonably balances public and private interests." The court said that when new beach is created with a restoration project, landowners still have the same right to access and view the water, but the court said Florida common law has never provided the landowner a right to own the emerging land as private property. Now the U.S. Supreme Court — including at least one justice who owns a vacation house on the water — will tackle the question. The resulting decision could have implications for all other coastal regions in the country.